The thymus was never a popular organ in the past. It first appeared in modern medicine in 1961, and since then it became a star in immunology and it is still a highly popular area of study. The thymus is a softorgan located in middle of the chest, just behind the sternum. In the early stages of human development, the thymus is a relatively large organ, covering the heart. The organ reaches its maximum size during the early teens, and weighs approximately 35g. However as the human ages, its size becomes smaller, and by the senior ages the organ becomes almost vestigial. The thymus was first mentioned in a book of anatomy back in the Roman period, but its function was never understood and 2000 years went by. In 1961, an unorthodox experiment was conducted where the thymus was surgically removed from a newborn mouse. The observed results were interesting: the thymus-less mouse became extremely susceptible to communicable diseases, didn’t develop properly, became debilitated and eventually died. In addition, when injected with red blood cells taken from a sheep, the mouse did not develop the antibodies as it should have done. It was discovered that the mouse had both contracted an immunological disease, and immune deficiency. This experiment demonstrates the significance of the thymus. Thymax Beaute is the result of years of research focused on the function of this organ. The thymus contains a large amount of lymphocytic cells. Since 1961, 10 years of research had taken place and it was discovered that the thymus endows lymphocytic cells with the ability to differentiate between “autonomous” and “non-autonomous,” thereby acting like a school for lymphocytic cells. Lymphocytic cells with this ability to recognize foreign agents are called T-cells, and are delivered to throughout the body. Thymax Beaute has a deep relationship with these T-cells, and its activity is essential to the active formation of antibodies by B-cells. The role of T-cells as the command center of the immunological network in the human body is evident. 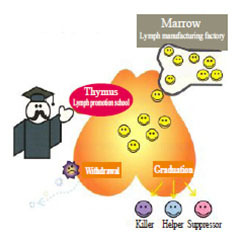 Various agents are involved in the production, induction, differentiation, and maturation of T-cells (T-lymphocytic cells). Agents such as thymosin and thymuline, which are responsible for the production of lymphocytes in bone ｍa rrows, are heavily studied, and in countries such as Italy and Germany, are being used to fight congenital immunodeficiency, cancer-induced　secondary immunodeficiency, and auto immunodeficiency. Additionally, agents that relate to the maturation of lymphocytes within the thymus, such as thymopoietin, are collectively called cytokines. Of these cytokines, interleukin (IL) is widely researched. Interleukins are communication agents that are produced in various immunocomponent organs. It is thought that immune tissues exchange information via these interleukins. Interleukin (IL-2, IL-3) are already being put to practical medical use against autoimmune diseases and malignant tumors. It is hypothesized that the reason that the size of the thymus decreases with age is because its function gets distributed to other internal organs, such as the spleen. 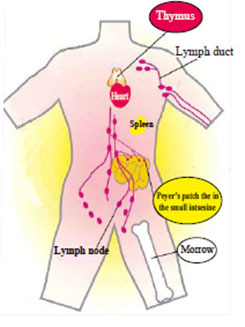 Of those internal organs, the Peyer’s patch, a mucosal surface located in the small intestine, is most well known. Active substances that are orally administered, such as Thymax Beaute, a peptide-like substance, passes through the stomach and reaches the Peyer’s patch in the small intestine. Since Thymax Beaute molecules are under 5μm (1/5000 mm) is size, they are easily absorbed, and are hypothesized to be taken in by specialized M-cells. 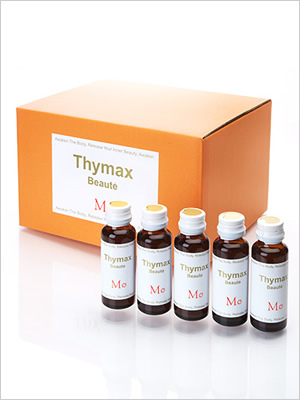 Thymax Beaute is extracted from the thymus of Specific Pathogen Free poke. 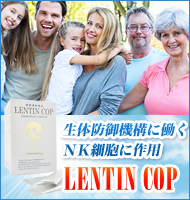 It is composed of a peptide-like amino acid complex, and the arginine-lysine-asparagine acid-valine-tyrosine combination is emphasized. 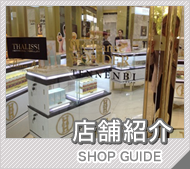 Additionally, the extraction process is executed with great mastery of biotechnology. The water in this process has the following characteristics: 50- 60Hz, redox potential approx. 110mV, pH8.0-8.9, hardness 29/1000mg. 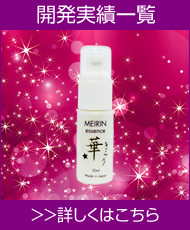 When compared to regular water, using this functional water (Hitoni Yasashii Mizu), allows a 150% increase in extraction. * Activation of lipid metabolism - Alteration of excess cholesterol into other substances, and subsequent excretion. Degradation of neutral lipids. *Activation of enzymes - Acceleration of digestion, absorption, storage, decomposition, excretion, and other beneficial enzymatic functions. * Involvement in digestion, absorption, metabolism - decomposition of fibers not suitable for digestion, decomposition of protein and sugars, promotion of digestion. * Production of resistive material - production of antibacterial substances in order to prevent settlement of foreign bacteria, and to maintain balance of enteric organisms. * Metabolism of medical substances - alteration of medical substances into other substances in order to alleviate side effects and to increase effectiveness. * Production of hormones and vitamins - production of steroid hormones and vitamin B1 involved in anti-stress, sugar metabolism, and anti-inflammation. *Decomposition of hazardous and carcinogenic substances - promotion of neutralization and excretion of waste matter, oxidative products, and carcinogenic substances. 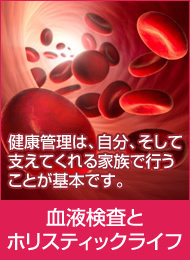 * Intestinal pH - prevention of proliferation of bad bacteria and bacterial pathogens, aid in intestinal peristalsis. 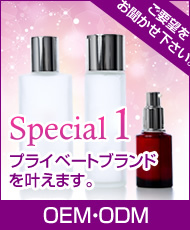 Although there is no upper-limit regarding daily dosage, 1-2 bottles per day(20 bottles/case) is recommended. Take Thymax Beaute everyday from Monday to Friday (and not on Saturday and Sunday). Repeat this cycle according to your condition and health requirements.